We first noticed there was something not quite right when Logan was only about a month or so. He only ever slept with his head to the right and there seemed to be a restriction of movement in his right arm. He’d had the standard health visitor checks and I got him weighed weekly so mentioned it to them then but nothing was really done about it. On Logan’s 8 week check-up, I raised my concerns with the GP who explained flat head syndrome and the importance of tummy time. I used to take Logan to baby groups and ensure there was plenty of tummy time. I even used every toy going to get him to turn the other way, but no response. When his head appeared to be getting flatter, we were referred to the physiotherapist who explained that the tightness in Logan’s neck and shoulder was something called torticollis. To help relieve the tightness in his muscles, the physiotherapist provided me with some exercises to do at home with Logan. Although we did these exercises daily, there was no real change. Soon, his forehead began to misshape and his ears appeared misaligned. On the follow up appointment, I was told about the TiMband and we immediately made an appointment at Technology in Motion’s nearest clinic to discuss our options. Dealing with Sandie was such a pleasure, she was welcoming, reassuring and very informative. Seeing other little ones there in their helmets showed us just how common it was. 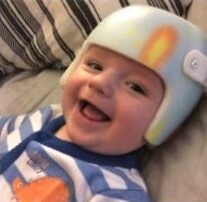 Logan was 22mm out on his right side so well into the red portion of the plagiocephaly severity chart. We signed up and paid the deposit there and then! Wearing the TiMband 24/7 for 5 months was asking a lot of Logan. But, once it was fitted, he just went with the flow. He amazed us at how relaxed and happy he was, not to mention how cute! We could not believe how well he responded to the TiMband, both in his happy demeanor and change in the flatness of his head. We soon got over the look of it and fed off his positivity and were the proudest parents around! We couldn’t believe how quickly we saw results not to mention the fab head of hair he grew under there! At the end of treatment, his final figures were well into the green portion of the severity chart! Success! We cannot thank the staff and creator of the TiMband enough. Without it, our little boy would not be able to wear a standard bike helmet or glasses. Thank you Technology in Motion!